A local Fife based Taxi company purchased our Remote Alert security camera monitoring application along with an YCam outdoor IP wireless camera sysyem, from our IP camera online store, in order to keep an eye on his taxi cars, and taxi drivers arriving back at the taxi headquarters. 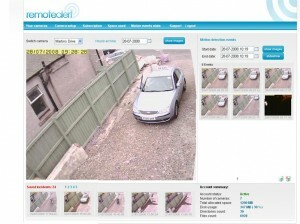 The Fife taxi car owner installed the outdoor security camera, set the witeless IP camera on his wireless network in his office, and within minutes was able to view Remote Alert online from the comfort of his computer. Feedback from the Fife based Taxi owner has been extremely positive, as he was, prior to reading about Remote Alert, considering to purchase a wireless CCTV security camera system at the cost of over £1,000. This price did not include having to also buy a security digital video recorder to view all recorded camera images. So far, total outlay has been £210 for the wireless YCam with outdoor housing, and he also signed up to the Remote Alert 100MB package @ £11.75 per month. Already, according to the Fife Taxi company, Remote Alert has already paid for itself, as the Fife Taxi owner has been enjoying a nice holiday, abroad, and is now more relaxed, than normal on holiday, as he is able to remote monitor, from his computer laptop, on the beaches of Spanish island, Majorca. From the feedback from the Taxi owner, his fleet of three taxis are still operating normally, and being cleaned and fuelled, by his taxi drivers, to the standard that he expects when he’s working at his taxi company in Fife. Another happy Remote Alert customer enjoying our security camera monitoring service from the beaches in sunny Majorca. His 2 week holiday was purchased from the savings that he made by not having to buy an expensive CCTV security camera and a DVR security recording system. This entry was posted on Monday, July 28th, 2008 at 12:13 pm	and is filed under Monitoring Solutions, Remote Alert, Small Business solutions. You can follow any responses to this entry through the RSS 2.0 feed. You can leave a response, or trackback from your own site.